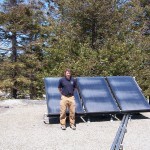 This title to this blog story will come as no surprise to anyone who I have talked to for more than 5 minutes over the past two years.Â First of all, a little bit of background.Â Of course, I love solar school projects because solar school projects are the ultimate multi-task educational platform. â€¢Â Â Â A teaching tool for students learning about energy, electricity, renewable energy, math and science.Â In some schools they use the solar and the sun to involve art and art history, mythology, and religion.Â The kids get to see the live data and do spreadsheets and projections, and play with their numbers from their solar electricity system rather than be limited to someone elseâ€™s numbers on someone elseâ€™s project. â€¢Â Â Â A working model to introduce school administration officials and local community leaders to solar electricity.Â If a school building in your community has a 1 kW PV system, you can use the data from that 1 kW and multiply it by 10 or 20 or 50 or 150 to determine how much electricity you would get from a larger system in that same neighborhood.Â You do not have to look at a map and guess because you have a working 1 kW model in your neighborhood providing you with current data. â€¢Â Â Â It does generate electricity from sunlight so it does reduce pollution if only in small amounts. 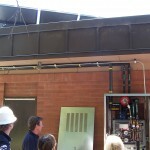 â€¢Â Â Â It also helps for everyone to see the panels and to get used to them generating electricity in their community. Now a solar thermal fire station that takes the heat of the sun (not the sunlight itself) and heats water for use in cooking and cleaning and washing at the firehouse seems totally removed from a solar electricity system on a school building.Â They seem to be apples and orangesâ€¦solar electricity and solar thermal heating.Â But here is what I have been arguing to anyone who would listen: Solar thermal fire stations are as close as we will ever get to solar electricity schools. â€¢Â Â Â Fire stations like schools are in almost every neighborhood in the United States.Â Every group of homes needs a school and a fire station. â€¢Â Â Â Kids learn in schools and schools take their students to fire stations to learn about fires and fire trucks and carbon monoxide and a long list of things that can now include solar energy. â€¢Â Â Â Most solar school projects have on line data so students can compare the electricity generation in Columbus, Ohio with Fresno, California and Apple River, Illinois and Houston, Texas.Â Now solar thermal fire station projects will also include on line data so students will be able to compare the heat generated on the fire station on their street with the fire stations in other locations that also have these solar thermal water heating systems on their rooftops. â€¢Â Â Â We make sure that solar schools install solar electricity panels that are visible from the school grounds.Â Solar thermal water-heating systems must be angled up to catch the winter sun so they are almost always visible from the grounds of the fire stations. â€¢Â Â Â Fire stations are run by Fire Chiefs and Principals operate schools and both fire chiefs and school principals are no nonsense people who can be very persuasive. There are so many solar schools around the world because school principals want them and it is hard to say no to a school principal.Â There can now be a lot of solar thermal fire stations because fire chiefs are as close as you can get to a school principle as anyone.Â Fire chiefs are tough and demanding and if they can be provided proof the economics are positive then I doubt you will find many city budget directors telling them they canâ€™t do it. So I am excited about our first solar thermal fire station which just went in on a fire station in Richmond, California.Â The first one was going to be on the Washington Township Fire Station at Hard Road and Riverside Drive in Dublin, Ohio, but that can be the second station.Â I am sure that Denise Franz King of Washington Township will not care that she had to be second so long as she gets her system. There will be a series of blog stories about this project and the data will be on all of our web sites and there will be a lot of pictures because it is the first one and we want everyone to understand why we created the project the way we did and why this makes it easier to replicate and how it all contributes to a positive economic spreadsheet.Â Cities typically are down on money so we had to make these projects able to pay for themselves.Â PG&E actually paid for the Richmond fire station project, but they did so in a way that enables us to build future projects based on the numbers from this one station.Â And we owe Karalee Browne of PG&E a tremendous thanks for her vision and her leadership on this project. (By the time this goes on line she and Travis will have their second son-she is really about to deliver as I type this, and she visited the fire station on one of her last days prior to going on pregnancy leave, which shows you how much she supported this project). All in all the news is good.Â The pollution reduction numbers are excellent and they are local.Â Less natural gas is burned inside any community where solar thermal water heating is taking place because less natural gas is actually burned in any building using solar thermal heating.Â These are good projects and the first one is up and running.Â In the next two months we will run a number of stories looking at this project from different perspectives because this is the model from which the rest will be built so understanding is the key. 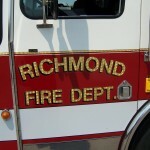 More pix and the data link will be in the next blog story.Â The fire station is Richmond Fire Station No. 68 on Bayview in Richmond.Â The fire chief is Michael Banks. The system is Heliodyne, Inc. The installer is SunWater Solar, Inc.Â Heliodyne and SunWater are both located In Richmond.Â Do you see the connection between jobs and renewable energy?Â If not, donâ€™t worry you will. 2008 is almost upon us. 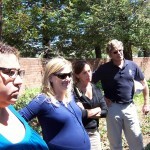 As we close out the year, we’d like to share reflections and some ideas for surging the sun in the year ahead. Here is a perspective from this year’s American Solar Energy Society conference, held in Cleveland, OH. It’s being held in San Diego this year – May 3-8. In fact the two largest solar conferences in the nation (ASES and SEPA/SEIA) are both being held in San Diego this year…help make 2008 a surging year for the sun! Put these events on your calendar. Driving through downtown Cleveland, Ohio for the American Solar Energy Society (ASES) convention, last July, I couldnâ€™t help but notice the decomposing warehouses, standing vacantly among the boroughs of the gentrified districts of the â€œMistake on the Lake.â€ I was passing by the stage where many steel workers presented their empty plea to future-looking authorities; the ensuing death that inevitably destroyed the antiquated industry of the past shined today in the presence of my brand-new hotel. My grandfather, born and raised in Cleveland, was one such loser in this battle with the â€œTechnology Age.â€ Invisible hands have actually brought impending unemployment to both my grandfathers, but thatâ€™s the beauty of capitalism, right? In all truthfulness, thatâ€™s correct. Regardless of our forefathersâ€™ exclamations, such as, â€œYou canâ€™t find a shoe made within the continental United States, anywhere!â€ this is the way things work in our globalized world. I have to ignore it when my grandfather calls and asks, â€œWhere can I get an American-made television? Our Sony is busted and Walmart only has Samsung in stock.â€ I never have the heart to tell him thereâ€™s no escaping international trade. Having the solar energy convention in Cleveland is exactly what the former proprietors of Cleveland had in mind when they put an axe to their industrial economy. â€œSomeday,â€ they might have said over cocktails at a local aristocratic dinner, â€œthe sons and daughters of the bone-broke factory men and women will thank us. They will be able to discuss alternative resources as plausible supplements to an economy that needs to go in that direction, anyway. Also, they will be able to buy Japanese TVs at discount prices.â€ Or theyâ€™d say something similar to that tune. Itâ€™s sad to say but they were right. Clevelandâ€”much like I hope for the rest of Americaâ€”was able to effectively cut their losses when it came to the costly economic dead weight of the steel industry; an industry that was physically dangerous for workers and extremely costly to run when compared to the low-cost of steel imports and the high-cost of American labor. But for solar energy, the evolution I am referring to requires a little more complexity, as the dangerous and costly industries that Iâ€™m suggesting (oil and coal) have permeated American and global life even further than the omnipotent steel industry. The oil and coal industries are, without a doubt, economic juggernauts with seemingly infinite resources around the world. Everything runs on, eats up, uses, and digests some form of these two resources. For America, however, a similar opinion was held by U.S. migrants less than a century ago regarding the aforementioned metal (steel). From Cleveland to San Francisco, America embodied ample land, so much land it was thought it would take centuries to lay the necessary tracks. America followed the economic path of least resistance and benefited from it resoundingly. If Cleveland was opening its once bitter doors to an alternative energy convention, then maybe thereâ€™s hope of incorporating solar energy into our national economy on a real level. Because this yearâ€™s ASES convention wasnâ€™t in Florida or California, but, instead, in Me-o, Oh my-o, Oh-Cleveland Ohio, the more I thought about it the more I felt satisfied with our countryâ€™s current state of events. When can someone actually say theyâ€™re participating in an event that proves that the Midwest might someday evolve economically? Well, I can. The ASES convention exhibits the Midwestâ€™s openness to the technologies â€œof the future.â€ Even though I embody the enemy of my grandfathersâ€”Idealists, who at one time were, as my grandfather put it, â€œtrying to move American jobs to Outer Spaceâ€â€”I am beaming to see if the economic evolution of Cleveland is, in fact, a microcosm for the potential evolution of our economy on the national scale. If a large Midwest city can open its doors to a new type of resource; if a people surrounded by their fallen industry can accept their evolving economy as a must; and if non-progressive citizens recognize their current oil and coal consuming trajectory as problematic to Americaâ€™s power (both home and abroad), then I am optimistic that our economy can evolve and incorporate alternative energy solutions in the same way that Cleveland left steel for something more safe and more effective. Parking my car in the lot, I walked up the underground tarmac to find the Cleveland Convention center and then my businessesâ€™ (Solar Resource Corp.) booth. I was excited to see if others had come to the same conclusion as I had. In many countries there is a principle in their legal system known as â€œGood Samaritan Lawsâ€ that make it a duty for people to help others in need. If you see someone drowning, but you cannot swim, you are not required to jump in and try and save them because you would be at serious risk yourself. But if you are not at serious risk, you are required to help others in need. In the United States, Good Samaritan Laws are designed to remove the worry you might have about being sued in case something goes wrong with your attempt to prevent the person from drowning. We are a litigious society and here it is not only the risk of harm to our physical life that might creation some hesitation to help another person in trouble, but the concern that the person we are trying to help might later sue us. Many countries require you to help. In the US, we donâ€™t require you to help, but if you choose to, we may help reduce the risk of a lawsuit being filed by the victim or the victimâ€™s family. It is a subtle, but important difference and I think of this whenever I am in the building of â€œProject Open Handâ€ in downtown San Francisco. In 1985, Ruth Brinker, a retired grandmother who could cook heard of a close neighbor with AIDS dying-from malnutrition. She began cooking and delivering hot meals to seven people. Demand from the community grew quickly, as did financial and volunteer support. San Franciscoâ€™s Trinity Church loaned Ruth their kitchen and Project Open Hand (POH) was born. Project Open Hand has broadened the reach of its services to include seniors and those who are homebound and critically ill in San Francisco and Alameda County. There is paid staff, but it is the huge number of volunteers chopping up vegetables and getting meals and grocery bags ready for delivery 365 days a year that is the most amazing part of this operation from where I was standing recently on the roof of POH. 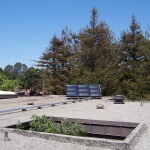 They had just completed a project with PG&E to add both solar electricity (23 kW) and solar thermal water heating for the kitchen to the roof of the POH building in downtown San Francisco. In addition to all the good they do in their primary mission, they want to reduce pollution while they are doing it. The PG&E donation will help produce 30,000 kWh of clean electricity and more than 170,000 gallons of clean hot water each year. It is a unique project. Many buildings have solar electricity and many others have solar thermal water heating systems. Very few buildings have both. If nothing else, it is also an educational roof. For anyone who is confused by the two technologies they can see solar electricity and solar thermal heating systems within a few feet of each other. I am already suggesting schools tour the roof to see the two technologies working in partnership to create two forms of energy that every building needs. POH expects to save about $12,000 in the first year through lower utility bills. POH is also planning on a phase 2 for both the solar electricity and the solar thermal water heating systems. They are an ambitious group. Just listen to POH Director of Operations Dan Schuman. The rooftop solar energy systems were dedicated on September 13, 2007 at a solar celebration in which a group of people gathered to hear POH Executive Director Tom Nolan, PG&E CEO Bill Morrow, San Francisco Treasurer Jose Cisneros, San Francisco Assessor-Recorder Phil Ting, San Francisco Commission on the Environment President Paul Pelosi, Jr. and Dan Schuman. PG&E volunteers staffed the kitchen and had to stop cooking long enough to run up and listen to their CEO thank everyone and then they all ran back to the kitchen. I was there representing the Foundation for Environmental Education and two little things left a lasting impression on me. Project Open Hand fixed lunch for all of the guests at the solar celebration. It was just like we were another group that needed a good hot meal. And the meal was delicious. I even had a cookie. You are currently browsing the archives for the Solar Thermal category.